At one point the track takes two different routes (marked "track" and "bypass"). The track takes you down through a rock tunnel several metres long and the bypass takes you around a large, jutting rock over-hang. The track then descends into a small valley that contains the largest number of caves on the walk. It is worth spending a little time exploring them with a torch, although care must be taken. Cave weta are found in the Onepoto Caves. These harmless insects gather in the caves during the day and venture out at night to feed on plants. 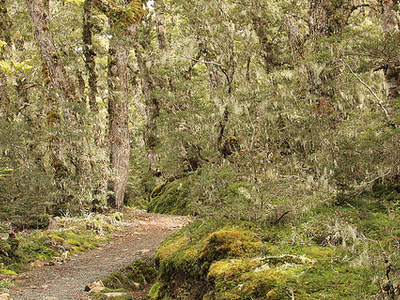 Here's the our members favorite photos of "Trails in Te Urewera National Park". Upload your photo of Onepoto Caves Track!